In truth, every single time we come across any home, we tend to make an assessment on the kind of people who live there based on the way it looks. That is just how it is. After all, a home is indeed, in so many ways, a reflection of the one who owns it. Whether you’re having a new home built or renovations done, you will always see to it that every single aspect of that home is an accurate expression of who you really are. At MK Home Design, we help you make your Gordon home everything you want it to be, and more. Naturally, every home owner wants their home to be as aesthetically pleasing as they can make it. Some designers, however, put too much focus on the aesthetics of the place, and put functionality in the backseat. That is something you cannot say about our resident home designer, Martin Kolarik. Over the years, Martin has earned a reputation as one who blends form and function perfectly. Whether it’s an entirely new home or a major home renovation, Martin sees to it that a home’s decorative aspects never overshadow the need for, say, good lighting or ventilation. While all of Martin’s projects look great, they are also as functional as they can be. If you have worked with other home designers in the past, it’s possible that you have come across one who treats every project like his or her own personal artistic showcase, with very little regard for what the home owner wants. This should not be the case. While a home designer’s expertise is absolutely necessary to get the job done, that job will never be truly done if nothing about a home reflects the personality of the home owner. When designing a home, a good home designer should always take to heart any input from clients. They are, after all, the ones who commissioned the work. This is something that Martin perfectly understands—and practices with all of his heart. Martin has proven to be more than just a great home designer. He is also a great communicator and listener. This is reflected in all the projects he has worked on over the years. While his work will always bear his mark as a top-notch home designer, it is apparent that his clients’ vision is seamlessly integrated into every single project. He believes that there must always be a balance between his own vision and those of his clients, and this principle is quite evident in every home he works on. When working with clients, we at MK Home design ask our clients exactly what they want with their new home. We ask them the most pertinent questions to make sure everything is done in accordance with their wishes. For instance, we are bound to ask about their budget, and how flexible it can get. We also ask about seemingly ordinary but absolutely essential details, such as the number of residents, or whether or not they expect any number of visitors on a regular basis. Home design involves a myriad of details, and we at MK Home Design make absolutely sure that every single aspect is covered, and covered well. As a home owner, you can do any kind of home renovation you want. However, if you are planning to embark on a home renovation project, it is ideal that the renovation be major in scope. Why do we recommend this? Imagine getting, say, your kitchen renovated, which is all well and good. How do you think would your entire home look when your sparkling new kitchen is in stark contrast to the rest of the home which has never been touched for years, even decades? Let’s say you want to make the façade of your home a facelift. This would be just fine, if not for the roof that is starting to show explicit signs of wear and tear. Few home designers have as deep an understanding of Bushfire safety and local council regulations as Martin Kolarik. 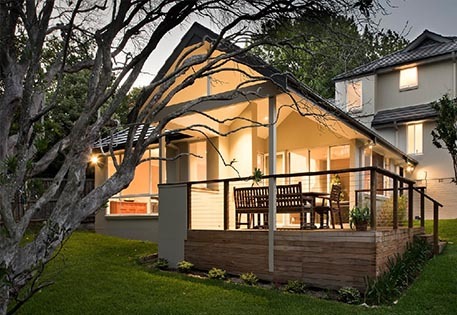 Whatever regulations the Ku-ring-gai Council is implementing for home design and renovation in Gordon, you can be absolutely sure that Martin will work them into his design for your home. The same goes for Bushfire Safety, which has become quite indispensable in a world that’s getting warmer by the minute. For the sake not only of your family but your entire neighbourhood as well, ensure that your home design or renovation was done with Bushfire Safety parameters in mind. If Martin Kolarik is your home designer, you can rest easy knowing that all of those parameters will be followed to the letter, making everyone the safer for it. So when the time has come for you to build a new home or renovate an existing one, feel free to give MK Home Design a call. Martin and company will help make sure that everything about your home design and home renovation in Gordon will be just as you wish.